Unite in opposition to Apartheid. Title: Unite in opposition to Apartheid. Historical note: Friday 1 May 1981 was the second National Day of Action organised by HART (Halt All Racist Tours) to stop the Springboks from touring New Zealand. In Christchurch, four separate marches were organised from different points in the city (Riccarton, Sydenham, Lancaster Park and Merivale), which converged on Cathedral Square for a rally. 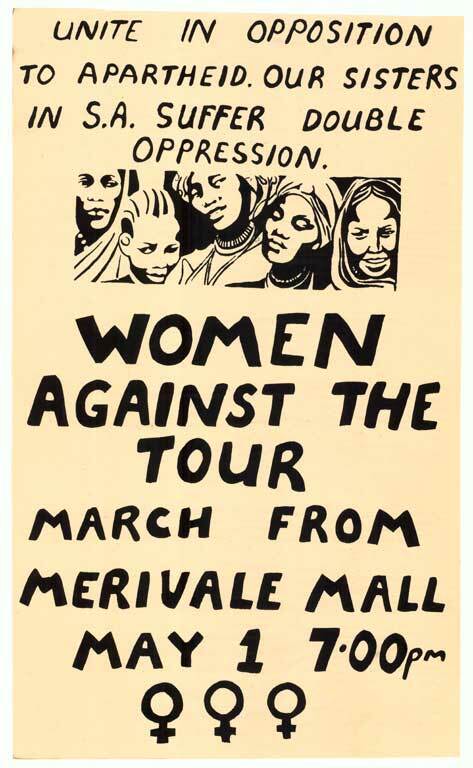 Several groups were involved in organising the marches, including the Christchurch Coalition against the Tour (CAT) and Women against the Tour.